Some Good Advice on Buying Diamonds - My good friend, Jonathan Siegel, has some good advice about buying diamonds on his website. You can see it at http://www.diamondringsofhouston.com/understanding-diamonds-jewelry.html. Gold Buying Scams - You see a lot of advertisements for firms offering to buy your unwanted gold these days. Some are real rip-offs. 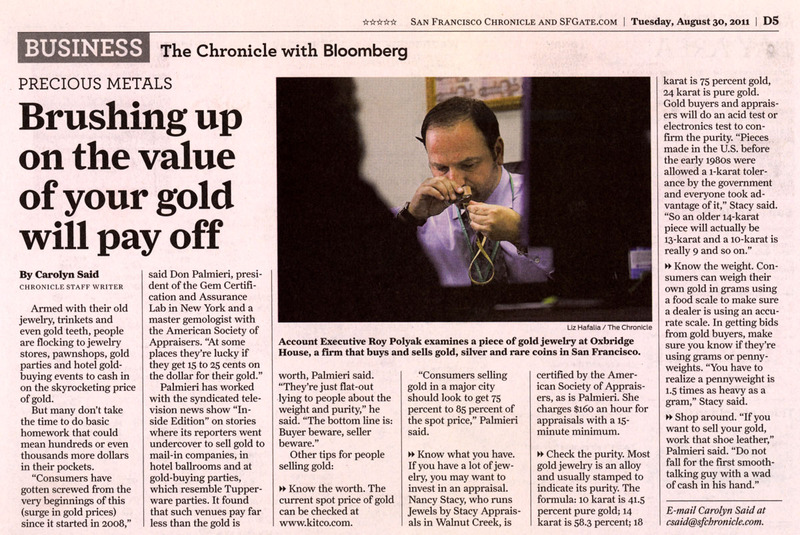 Here is an article I wrote for the American Society of Appraisers titled "Selling Gold and Precious Metal Jewelry". Here is an earlier article from the San Francisco Chronicle that I contributed to. See article. Cruise Purchases of Jewelry - Planning a vacation to an exotic resort—sunny beaches, lazy days, romantic nights and . . . jewelry store after jewelry store selling bargain “duty free” glitter? You will want to check out Smart Shopping When Traveling Abroad on the ASA website. It is full of good advice. You might also want to do a little searching on Ripoff Report at http://www.ripoffreport.com/default.asp Search on your destination plus “jewelry”, or search on “Cruise Jewelry”. I created a digest in MS Word format of postings on Ripoff Report regarding Diamonds International. Click here to download this digest. Too late? You can file your own report on Ripoff Report. It might help in resolving your own situation. Also, fill out a Fraud Report for the Accredited Gemologists Association, which you can access at http://www.accreditedgemologists.org/ccq/index.php. These complaints are being collected for future use by the appropriate Attorney General or in a possible class action lawsuit. Buying Gemstones in Afghanistan (or Anywhere Overseas)? - Check out the article at the link below. Lead Glass-Filled and "Composite" Ruby - There is a lot of this on the market today. It is cheap & may be tempting but know what you are getting (and PAY for what you are getting). See the article at http://www.multibriefs.com/briefs/agta/RubyLetter112409.htm. Shipping jewelry? Learn how to correctly package, insure and mail your jewelry safely here: Packaging Jewelry for Registered Mail.